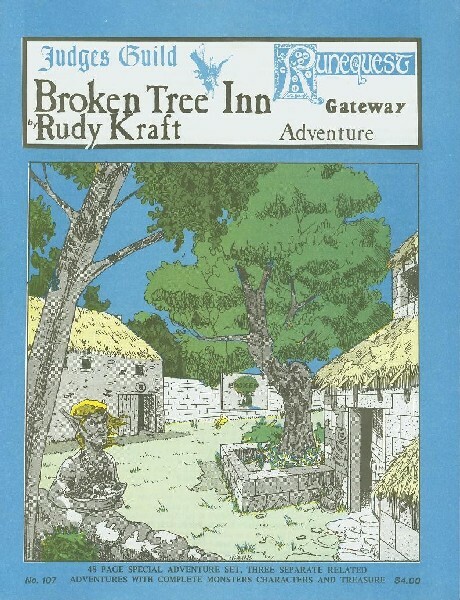 This 48-page booklet contains three Runequest scenarios and background information, concerning the struggle between the Aldryami Elves and Dryads of Tall Seed Forest and encrouching Men from the adjacent Empire of the City of Whorn. It includes highly detailed histories and legends of the forest, the Inn, and nearby Troll Country, and one of the Empire's frontier forts. Characters ranging in ability from newly rolled to nearing Rune Status can be included in the adventures without too much difficulty. The standard Runequest format for listing character and monster statistics has been used and explained. This is a Judges Guild Runequest Gateway, created and officially approved for use with Runequest. 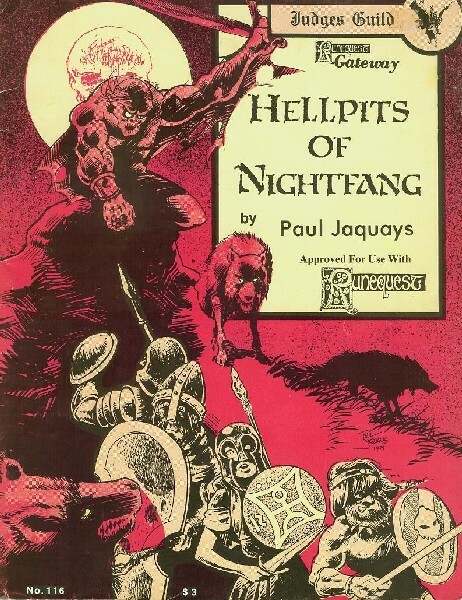 The HellPits are a series of limestone "karst" sinkholes, and there are various inhabitants: one is the ancient tomb of a great hero, while another is the lair of a vampire, Nightfang, and his motley followers. NightFang has a taste for rats and player-characters. While intended for characters of fairly low expertise, experience as a player is called for. Inhabited by rock lizards and dragon snails, this 16-page mini-dungeon is highly detailed, and handsomely mapped and illustrated in the Jaquays tradition, with a full-color cover. A pool of ten bound spirits and ancient holy ground can also be found in the HellPits. This is a Judges Guild Runequest Gateway, especially designed and approved for use with Runequest. Two large 11"x17" sheets of cardstock printed in red and black on buff for no-glare reading at a distance. All the charts and tables necessary to play the Runequest combat system are printed here in large size rearranged to aid play efficiency. 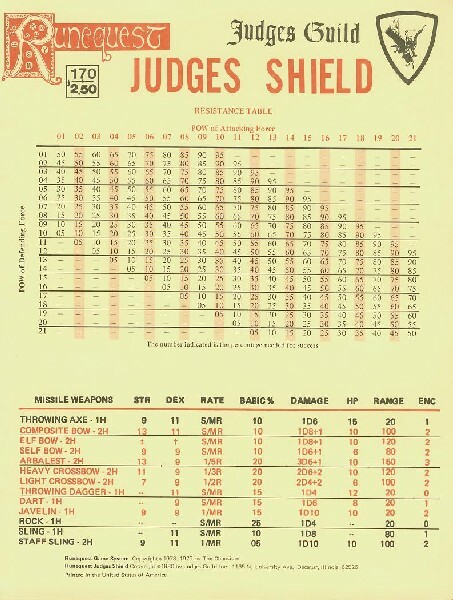 All those Tables necessary for the Players are printed on one side, and all the Tables and Reference Material necessary for the Judge are printed on the other. Appropriate page numbers are given to speed reference to the rules othose few occasions the Shild information is insufficient. 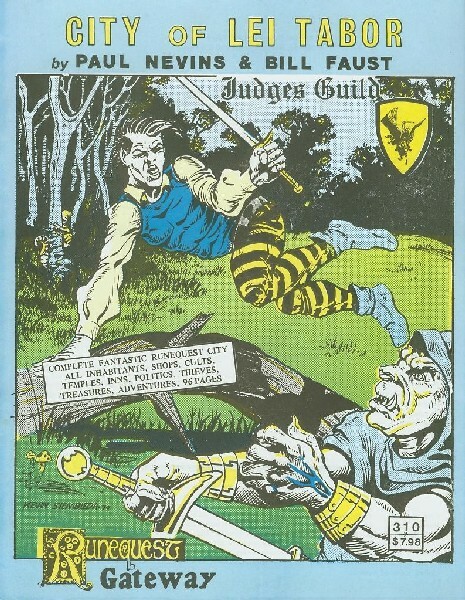 The tables are based upon the just released Runequest 2 and included information from the Cults of Prax. The sheets are designed to fit together to form a screen concealing the Judge's confidential information, secret die rolls, etc. 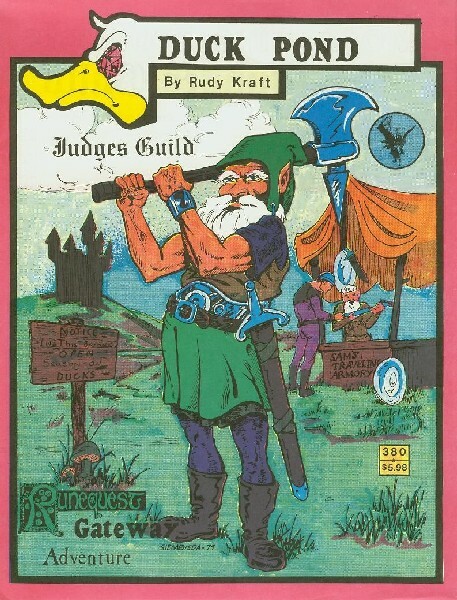 This playing aid is specially designed and approved for use with Runequest. 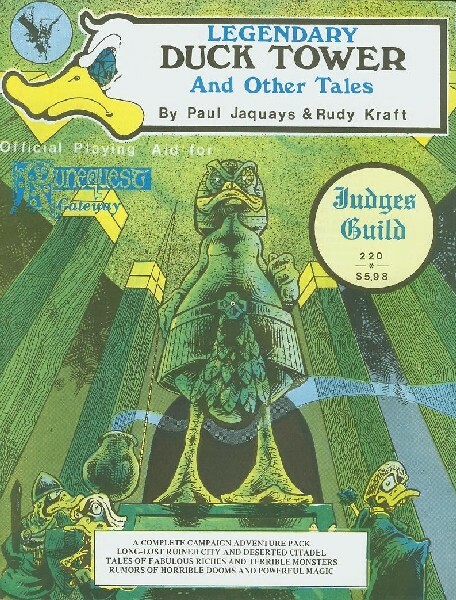 The legends of the fallen citadel of Duck Tower have long haunted both Ducks and Humans. Recently, the location of the tower has been rediscovered and parties of brave adventurers have begun to seek it out in hopes of finding the great treasures rumored to be there. These treasure will not easily be obtained as the area is guarded by many creatures who have always known that Duck Tower was no legend. This 64-page scenario pack was created and officially approved for use with Runequest. The first complete City for Runequest. A huge 96-page book describes the feudal Duchy of Lei Tabor, a semi-independent seat of power and religion. Ruled by the Duke and his clan, it is the last vestige of a once mighty empire and still dominates the area. Book includes maps, shops, cults, temples, inns, politics, inhabitants, treasures, plus adventures. An official adventure approved for use with Runequest. This is a 64-page Campaign Adventure created and approved for use with Runequest. Duck Pond was once the site of a small fishing and trading village inhabited by Humans. The village was later on destroyed by Mallia worshippers. Eventually, Frwack the Duck took up residence here and is about to fight Oassanai the Dragonewt to the death.